Chickadees are easily identified by their namesake call "chick-a-dee." The Black-capped generally sings out a "fee-bee" call while the Carolina sings "fee-bee fee-bay"; however, this song is learned and, in overlapping territories, may be learned from the wrong bird. Chickadee's wing beats are about 27 times per second. This compares to a hummingbird's 80 beats per second. 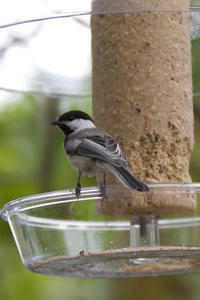 The Black-capped Chickadee primarily eats insects during the breeding season with some seed and fruits. The non-breeding season finds them eating about half animal and half vegetable matter like seeds, spiders, insects, and even the fat from carrion. Mountain Chickadees do a lot of foliage gleaning, looking around branches and leaves for insects, beetles, larvae and spiders. They enjoy seeds and will readily visit feeders. Chestnut-backed and Black-capped Chickadees watch other birds' foraging success to see if they should adapt their behavior to be more successful. Boreal Chickadees enjoy insect larvae, beetles, moths, spiders, egg masses, seeds and tree berries. They will visit feeders. Boreal Chickadees usually cache food in the same tree in which it is found. They store them in crevices on main branches close to the tree trunk and make sure they are visible from below. Presumably so they may be more readily found when snow is covering the upper portion of branches. The Boreal Chickadee's winter-cached foods are most often stored lower on the tree in which they were found but high enough above common snow lines. Chickadees are generally monogamous, mating for life. Usually chickadees lay six to eight white eggs with a light reddish-brown speckling. Research has shown that while chickadees are regular visitors to feeders, over 75-80% of their winter food supply still comes from natural sources. When the temperature falls below 10°F, research has shown that the survival rate of chickadees almost doubled when they had access to feeders. This resulted in an overall higher winter survival rate of 69% versus a 37% survival rate for populations without access to feeders. Chickadees have excellent coping tactics for surviving harsh winter weather. They cache foods and remember where they are hidden, have dense winter coats, diligently find excellent, well-insulated roosting cavities and can perform a regulated hypothermia to conserve energy overnight. Have you noticed how ravenously the birds eat at your bird feeders, especially first thing in the morning and just before dusk? Chickadees can gain as much as 10% of their body weight each day and lose it all again during a cold winter night. Chickadees are able to perform a controlled hypothermia at night to drop their body temperature about 12-15°F lower than their normal day-time temperature. This allows them to conserve about 25% of their energy every hour at freezing temperatures. Chickadees weigh less than half an ounce. Black-capped Chickadee - 12 years and 5 months. Carolina Chickadee - 10 years and 11 months. Mountain Chickadee - 10 years and 1 month. Chestnut-backed Chickadee - 9 years and 6 months.